We decided to do the June wine dinner on the first night of Italianfest here in Newport, Kentucky, so of course we had…Thai beef salad! Okay, so there’s really no connection there. However, you may recall this meal from last year because Christine liked it so much that she requested a repeat. The spring rolls were easy to make and I whipped up a spicy peanut dipping sauce to go with them. For filling I used lettuce and a little mint and parsley from our garden along with some shredded carrots, peanuts and shrimp. The shrimp were frozen and only took about three minutes to cook in boiling water. The most challenging part was rolling them up in the spring roll wrappers, but after the first couple I got the hang of it. After I had the appetizer ready I made the mango puree for the dessert and put it in the freezer. It is supposed to be refrigerated for 3 to 4 hours before serving, but I got a late start so I put in the freezer to cool more quickly. I cleaned up the kitchen a bit, as cleaning is really my specialty, and then prepared the sauce and all of the cold ingredients for the beef salad. You may be asking yourself, “Where is Christine all this time?” Christine had gone to see a movie with our friend Susanna, who was joining for dinner later. In addition to being the first night of Italianfest, it was also the night we had one of the worst and longest lasting rain and thunderstorms of the year. Christine and Susanna had walked to the theater and since it was too rainy to walk home, holed up in a bar to have a martini…and then another. Oh, the humanity!!! Finally they called me and I went to pick them up in the car and return them to the house for dinner. After the main course, I prepared the dessert, adding some watermelon balls to the pureed mango in stemmed glasses for a cool and refreshing treat. As for the wine, we all liked it and thought it complemented the meal nicely. The label said that the wine was best served slightly chilled so I had put it in the refrigerator for a while. However, we all thought it was actually better when it warmed up and also when it had been sitting out for a while with a chance to breathe. For a finale we had a little tasting. I opened up a bottle of my special homemade ice apple dessert wine along with some similar wine sent to us by our friends Sue and Mark, owners of Maple Leaf Orchard in Wisconsin (http://www.mapleleaforchard.com/). Both made for a sweet digestif to end the meal. “The Crusher” is a midpriced line of wines – all have a suggested retail of $18. 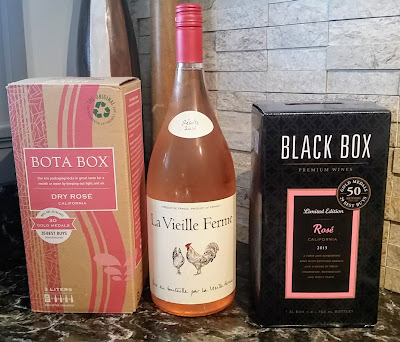 These wines (with the exception of the Rosé) are from the Clarksburg appellation in California. Clarksburg is about 20 miles south of Sacramento (although it’s described as the “Bay Area Delta”). Since it’s a good ways inland, this is a hot, dry area for grape growing. Hotter growing areas usually lead to fuller, fruitier, sometimes less complex wines. What did we find? The Crusher 2008 Cabernet Sauvignon – The pairing notes on this one states that it “commands steak!” so I took the bottle along to a cookout we had recently with the Sweet Partner in Crime’s family. I was grilling up strips and filets, along with some similarly charred asparagus and the SPinC’s magical Dijon-and-tarragon potato salad. The meal’s quality was guaranteed. We cracked the wine, let it breathe for a bit, and let the family sample. “It’s kinda fruity,” said Postal Donnie, the SPinC’s brother-in-law, “Tastes kind of like a merlot.” I concurred. It was a very fruity, very soft cabernet sauvignon. The tannins were almost too light. There was plenty of fruit on the body and there was a nice blackberry and currant on the nose. The finish, though, just trailed off into fruit and a little tannin. It was OK with the steak, but the smoky grilled flavor beat up on the wine a bit. It did alright with the other sides. The wine was decent, but I can find a better $18 cabernet. The Crusher 2009 Chardonnay – One thing that immediately jumped to mind when I cracked this bottle was, “Hey, I just don’t drink a lot of California Chardonnay anymore.” I was curious as to how this reintroduction would go to Cali Chard. I was initially dubious. The nose is quite ample – apple, smoke, and licorice. The first thing we noticed about this wine’s flavor was the oak. “I would have loved this wine eight years ago when all I drank was Meridian!” exclaimed the SPinC. It is quite oaky, especially on the finish. There’s butterscotch and more apple on the palate. It didn’t agree with me – until dinner. I tried my hand at veal saltimbocca, which I’d never made before. Why not, right? The result – very pleasant! The meat and sage tamed the oakiness, leaving a smooth, buttery flavor that complemented the light meats quite nicely. We had a throw-together salad of artichokes and tomatoes on the side. Artichokes are a wine killer, but it handled them satisfactorily. If you like oaky chardonnay or need a white for light meats with richer sauces, this is certainly a winner. The Crusher 2009 Rosé of Pinot Noir – Summer started slamming us, so I was very happy to see pink amidst the samples. As the name suggests, this is mostly Pinot Noir, with some Viognier thrown in for good measure. The appellation listed for this wine is simply “California,” so I assume that it’s a blend from vineyards across the state. It’s a deep salmon color out of the bottle and is a very “full” rosé – light enough to be refreshing, but with enough body to be interesting and complex. Strawberries and cranberries were my thought at tasting. A little creaminess to the body and a nice acidic zing at the end. “This is a really pretty rosé,” said the SPinC. I tried it next to a tomato and fennel based seafood stew. Quite nice. The solid backbone allowed it to stand up next to a varied set of flavors. It’s a pairing I’d certainly have no qualms about pulling out again. On a hot day, this would be a great wine to pour for friends who are exclusively red drinkers. There’s enough going on to keep them satisfied. A very nice example of what California rosé can be. The Crusher 2009 Pinot Noir – I’m a big fan of cool weather pinots, so I was particularly interested to see how this one spun out. At first pour (after 30 minutes of decanting), I thought this was a particularly “sharp” pinot noir. It makes me think of what pinot noir would taste like if it were grown in a hotter climate than it was used to. The basic cherry profile is there, but there’s a strong coffee taste – as if you’d made chocolate covered cherries, but covered the fruit in crushed cappuccino beans instead. Powerful, strong wine – reminding me more of a merlot than a traditional pinot. However, it worked with our dinner: grilled lamb burgers with Indian spices topped with cucumber raita (or tzadziki…same diff…) alongside some grilled corn kernels tossed with artichokes. It was a big ‘n bad enough wine to handle those kinds of strong flavors. For a grilling evening, dinnertime pinot – it was certainly serviceable, although you could probably find a less expensive pinot noir to fill that bill. The Crusher 2009 Petit Sirah – As I was getting ready to write this column, I got an email announcing that this wine had won gold at the California State Fair wine competition. I was looking forward to trying it. The tasting notes indicate that it’s an “an exceptional barbeque wine” since it goes well with brown sugar barbecue sauce. I didn’t want that much heavy meat, but I make a killer spicy mu shu, so I cobbled that together, figuring that sweet, spicy, and meat could work. On its own, it’s certainly a serviceable wine. The very fragrant nose is full of blueberries and plums. The flavor is quite jammy, as I expected from a petit sirah. The jamminess makes it a bit heavy on the palate with straight fruit, but the finish gets a little more interesting with some pepper and firm tannin. With the mu shu, however, this wine shone. A little spice and a little sweetness really brought out fruity complexity, while letting the Asian flavor stand up. It’s a wine that can certainly handle a splash of Sriracha, which you don’t see often outside of Rieslings. I don’t know that I’d recommend it on its own, but alongside meat with a zing, it works. La Vigna Estate Winery – More good stuff...from Ohio? A cloud of road dust, stirred up by an early blast of summer heat announced our arrival at La Vigna Estate Winery, just outside of Higginsport, Ohio. Higginsport is a dot on the map along US 52 – the road that traces the curves of the Ohio in the southeastern corner of the state. We were greeted warmly by John (short for Giovanni) Brunicardi, a clear-eyed and charming 80-year old Italian man. Within the first few minutes of meeting John, the Sweet Partner in Crime and I had the scoop on how a winery on a hill overlooking the Ohio River ended up with its name. Leaning on his quartz-topped cane, John explained to us that “La Vigna” was the name of one of his father Antonio’s two vineyards outside of Lucca in Tuscany. “It tickles me that they name the wines after my family’s old vineyards.” Antonio emigrated to the U.S. after World War II. John’s daughter, Armanda, married La Vigna’s winemaker, Brad Hively. Brad was manning the tasting table, so we got the lowdown on the place. Brad, a straightforward, confident storyteller, told us that he had been in Charlottesville doing some consulting work for the University of Virginia when he caught the winemaking bug. He started doing home wines from a kit, then purchased grapes, and finally started growing his own. He moved to that corner of Ohio in 2002 and established the first vines on his property three years later. Since tasting traffic was a bit slow, once Brad learned that we were semi-knowledgeable, he offered us a tour of the vineyard. In the vineyard, which sports an absolutely gorgeous view of the river below, Brad was quick to point out that all of his wines were “estate” wines, meaning all the grapes were grown on the property. “We wanted to do something different. We didn’t just want to make a bunch of fruit wines or import a bunch of juice. We wanted something that worked. With the soil and climate of this particular piece of land, we were pretty sure we could make European style wines.” La Vigna currently has two acres planted with expansion plans for 15 additional. Petit Manseng is a white wine grape grown largely in the Jurancon region in southwestern France. The grape traditionally produces a sweet, late harvest wine, somewhat like a Sauternes. However, the concentration of juice comes from long hanging on the vines rather than noble rot. The La Vigna 2010 Proprietary Late Harvest Petit Manseng is sweet, but a honeyed sweetness like a Sauternes rather than a sugary one. There are plenty of apricot and peach flavors along with a little bit of baking spice in a rich, smooth package. Lovely. It’s available in 375ml bottles for $12 -- a great value. Brad also concocted a dry version of the Petit Manseng – his 2009 Proprietary White. He was only showing this wine, not selling it, since “we’re down to our last three bottles.” Brad said people ask all the time, “’What does it taste like?’ I tell them, ‘It doesn’t taste like anything else.’” I thought he was on the mark. I couldn’t really put my finger on the flavor. Perhaps it would be helpful to say that it was an interesting cross between a Viognier and a Pinot Grigio – floral, lemony, and with an interesting “nutty” flavor. I enjoyed. Normally retails for around $19. Apparently there may be a few bottles still around in Cincinnati-area wine stores. If I see one, I’ll be snagging it. La Vigna also does two red wines. The first, the 2008 Proprietary Red, is a blend of estate-grown cabernet sauvignon and cabernet franc. It’s a big frickin’ wine. Powerful flavors of blackberry, leather, and a slight herbal flavor that sometimes pops up in wines from Bordeaux. The wine needed a big, big swirl to open up. Brad said that it was still a bit in bottle shock – that it needed about another month in the bottle to integrate, but that it would cellar for years of someone took a notion. I thought it was a very solid “big red” that’s made for big meat dishes. Since it’s available by the bottle at Jeff Ruby’s steakhouses in Cincinnati, other folks seem to think so. Retails for about $23 a bottle. Finally, there was Carnevale 2009, the La Vigna “drink now” red wine. Made from 100% cabernet franc, this is a light, fruity, easy to quaff red. While Brad said that he makes it in a French style, it reminded me of something that might have come from “Carnevale”– another of his grandfather-in-law’s Tuscan vineyards. I thought it was similar in flavor to a light Italian red like a Valpolicella. While we were there, “Fireside Pizza” had its portable oven up and running, so we had a couple of glasses with a Naples-like margherita pizza made on the spot. The Carnevale would be an excellent food wine with any kind of red sauce. I thought it tasted good with a slight chill on it, especially on a 90+ degree Memorial Day weekend afternoon. For $12, an excellent summertime red. Brad said his next challenge would be to clear more acreage to expand his planting. The next grape varietal he wants to get in the ground was Albarino, one of my favorite Spanish/Portuguese grapes. What an interesting and potentially fruitful (I know, I know…) choice. I thought La Vigna was approaching these wines in the right way. Rather than going for a quick turnaround, they’re trying to find “real” wines that will work. Of the wines from Ohio that I’ve tried so far, only Kinkead Ridge (which is less than 15 minutes further down the road if you’re making a wine-tasting day of it) has matched what La Vigna is accomplishing. Since La Vigna is a relatively young winery, I’ll be interested in following their progress over the coming years. They’re definitely worth checking out. The winery is open for public tastings on Saturdays throughout the summer from 12-6 pm.